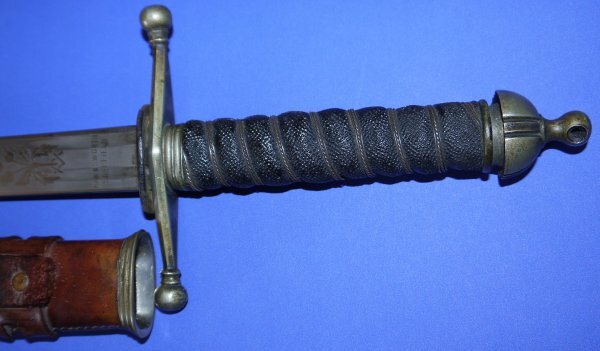 In very good condition, a WW1 Highland Light Infantry Named Officer's Presentation Cross-Hilt Broadsword. With both the owner's initials "V E G" and “Presented to Captain V.E. Gooderson by Glasgow High School Drill Corps May, 1915” etched to the blade, Valentine Edgar Gooderson was an officer serving with the HLI (Highland Light Infantry) during WW1. At one point, Lieutenant-Colonel Valentine Edgar Gooderson, DSO commanded the 18th (Service) Battalion of the HLI during WW1 after the previous CO was injured and died. 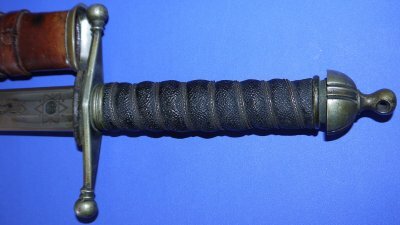 Sword made by Hawksworth of Sheffield. 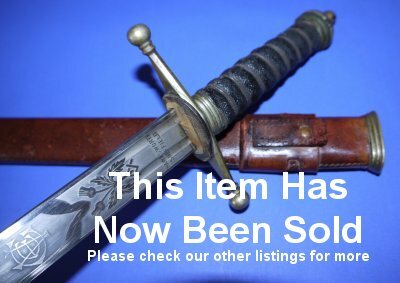 The supremely well etched blade is in very good condition and firm in the hilt. The hilt all good, as is the grip, as is the associated twisted grip wire. The leather field service scabbard is sound but with a number of scuffs / nicks to the leather. A truly great sword with full provenance. It can be yours for £? (too late, now sold). Please quote reference AE30 (0778). Further / full sized images available upon request.